Omar Abbas is a student from Damascus. Dr. Jalal Nofal, born 1963 in Damascus to a working class family from as-Sweida', is a prominent psychiatrist and activist who has been involved in politics and relief efforts throughout his lifetime. In 1978 Nofal joined the Communist Action Party (CAP), after rejecting the Syrian Communist Party’s pro-regime stances, particularly during the Muslim Brotherhood uprising (1976-82) and the ensuing government crackdown. "With regards to the Hama massacre (1982), for me as a leftist, the Communist Action Party took the most balanced and satisfactory stances," explained the doctor. Nofal, a medical student at Damascus University at the time, remained an active party member until his arrest in 1983, when the regime launched a nationwide crackdown against leftists. He was released in 1991 after more than eight years in prison. Like many of his contemporaries, Nofal decided to resume his studies, graduating from medical school and specializing in psychiatry. Ideologically, the imprisonment further reinforced the democratic tendency of Nofal's leftism, perhaps at the expense of his socialist beliefs, not unlike other former prisoners who brought their new ideas back with them to the Communist Action Party. Nofal recalled about how “the party (together with other groups) took a greater focus on democracy and countering the Baʿth party’s propaganda.”Despite these efforts, the nineties ultimately witnessed little change, as the regime rejected democratization efforts. [Photo: A banner calling for the release of Dr. Jalal Nofal, who was arrested on January 6, 2014 in Damascus (Syrian Left Coalition)]. This political dormancy lasted until 2000, when Bashar al-Asad’s rise to power and promising rhetoric prompted many Syrians to renew their engagement in the democratization of society. Nofal enthusiastically received these developments and joined the Committees to Defend Democracy and Human Rights [CDF, a member of the Coalition for the International Criminal Court (CICC) and Euromed Rights), and participated in the Damascus Spring, when leftists and liberals worked on uniting the opposition and exposing the lack of reforms under "reformist" Bashar al-Asad. After sensing the danger of this movement, the regime cracked down on it as well, once again forcing political activity into secrecy. With the eruption of the so-called Arab Spring, however, Syria rediscovered outspoken political activism, as reformism and solidarity protests returned to the forefront. Nofal worked with the Damascus Neighborhoods Coordinating Committee to organize a protest in the capital’s Arnus Square on May 2, 2011, demanding democracy, an end to the regime’s violence and sectarianism, and the lifting of the siege on the southern city of Darʿa. He was arrested at the protest and spent ten days in ʿAdra prison before being released in an amnesty. He then returned to work with the committee, though it was soon dissolved after its founders were arrested. After that, he joined the Damascus Doctors Coordinating Committee, which was set up to cure patients, especially protesters, who were routinely arrested, abused, and tortured at hospitals in the presence of Dr. Nofal and his colleagues. This campaign was effectively halted, as were most others, by widespread arrest campaigns. Nofal also worked with the Syrian Arab Red Crescent (SARC), which in his words was "one of the few organizations where revolutionary humanitarian workers were allowed to operate." Nofal’s relief work focused on psychological and social support for internally displaced persons (IDPs) living in Damascus and victims and witnesses of conflict and siege throughout Rif Dimashq. "Working in Damascus with IDPs was far more dangerous as we were accused of supporting terrorism, while we had more liberties in Rif Dimashq due to the looser grip of the regime,” clarified Nofal. The government continued to clamp down on relief efforts, accusing any aid agency of supporting terrorism and arresting and exiling many field workers. 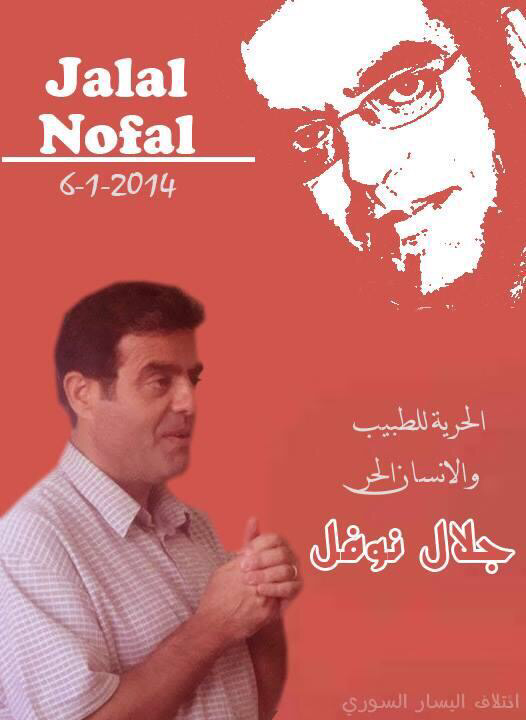 In April 2012, Nofal himself was arrested while on SARC duty in Rif Dimashq and subjected to torture while in prison. Despite all the hardships, Nofal went on to contribute to the foundation of a new political movement, the Syrian Left Coalition, upon his release, though it failed to gain traction. Towards the second half of 2012, the armed struggle began to take an increasingly prominent role, but Nofal persisted in his peaceful initiatives. In 2013, he was a founding member of the National Call Movement, which had over 200 members in Damascus and "called for the establishment of a democratic civil state that rejects sectarianism, Islamization and civil war," as Nofal put it. The National Call Movement members aimed to revive the peaceful movement and along with the Syrian Revolutionary Youth they installed speakers chanting anti-regime songs across Damascus. By early 2014, the network was exposed and disbanded; its members, including Nofal, were arrested and forced to confess under torture at the capital's Military Intelligence Branch 215. After his release in early July, Nofal continued his relief and civil society work, only to be arrested less than two weeks later. He was accused of funding terrorism by the Counter-Terrorism Court for having provided relief with his wife in Yarmuk, and spent six months in prison. When Nofal was let out in January 2015, he was smuggled out of the country and fled to Germany to join his wife, poet and activist Khawla Dunia, who had fled the country earlier. Nevertheless, this reunion did not last long. “What I could offer in Germany was far less than that which I could in Turkey,” explained the doctor. Nofal currently resides in the Turkish southern border town of Gaziantep, where he is a regular guest on programs such as those of Alwan FM, Radio Hara, and Radio Rozana. He is also part of a team of psychiatrists and social workers who work in schools and orphanages, while training therapists and supporting similar activities inside Syria. 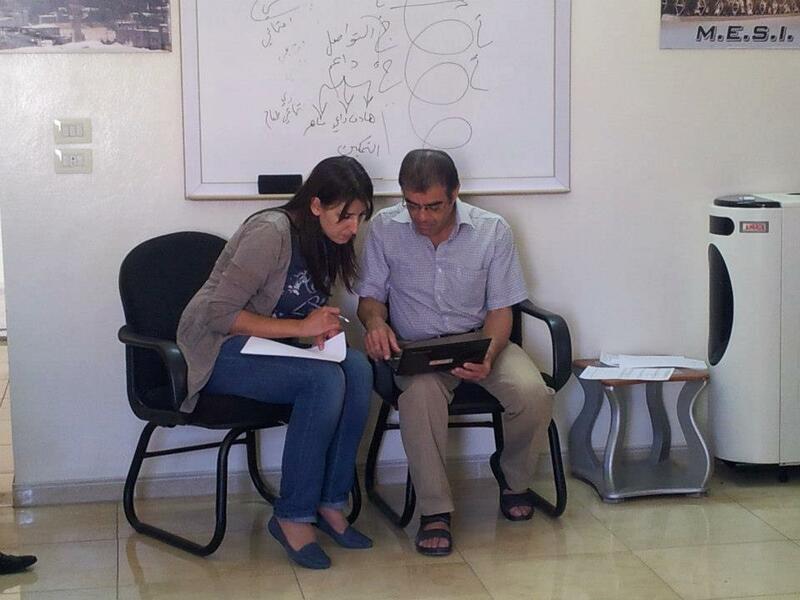 [Photo: Dr. Jalal Nofal with psychologist Wifa' al-Hayek - Yabrud - Rif Dimashq - 7-9-2012 (Yabrud Ahl al-Khayr Facebook Page)]. Jalal Nofal is an example of how many Syrian revolutionaries have never drawn a line between two inextricably intertwined realms: relief work and civil society activism. In their opinion, it is in fact impossible to ignore the political dimension that has led to the current suffering. [1st Photo: A banner condemning the detention of Dr. Nofal, who was arrested in Damascus on January 6, 2014 (No... Facebook Page)].